Verse Chorus Press, 9781891241369, 240pp. These paired novellas show a master writer developing some of his most emotional, vital explorations of America yet. In Some Phantom an unnamed woman arrives in a strange city, fleeing a violent relationship. She begins to explore the city and its inhabitants and takes a job teaching disturbed children, but she finds her own mental stability becoming more and more precarious. A marriage of The Turn of the Screw and Carnival of Souls, Some Phantom poses questions about the line between memory and madness, fantasy and abuse. These questions are further elaborated in No Time Flat, which follows Wade, a boy living a somewhat isolated existence with his elderly parents on the American plains. Wade makes his way through a childhood marked by playground shootings and mysterious strangers before becoming a wanderer himself, inhabiting a sparse landscape of fleeting connections, lost children, and unformulated crimes. 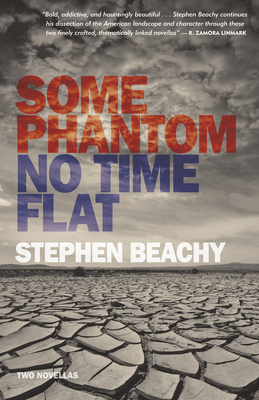 Stephen Beachy is the author of The Whistling Song, Distortion, and, most recently, boneyard. His writing has appeared in BOMB, The New York Times Magazine, Chicago Review, Best Gay American Fiction, New York magazine, and elsewhere. He lives in the San Francisco Bay Area and teaches at the University of San Francisco.